Having progressed through Killarney RFC’s youth section, I am very proud to have been selected as Club Captain for the 2016/2017 season. 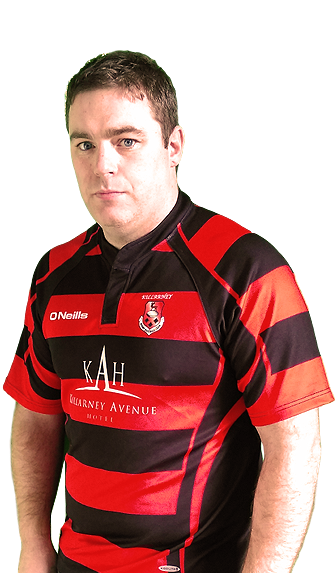 As a senior player of Killarney RFC I and my team will take great pride in wearing our club colours throughout the coming season and ensure to lead by example for our youths and we will endeavour to strive for success on the field. Over the last number of seasons, there has been an abundance of talented players progressing through the club to senior level. This is a testament to the excellent underage structure which is in place at the club. This season also sees many former players returning to the club in new roles bringing with them a wealth of experience. I am confident that the blend of youth and experience will make for an exciting and successful season. The aim for this season is to lead Killarney back to Division 2 while building a great bond and camaraderie between the players. Killarney RFC is a fantastic community club and without doubt, the backbone of the club is its hardworking volunteers, who give up so much of their time to run every aspect of the club. The recent move of the club to our fantastic new facilities in Aghadoe is a testament to the work of these volunteers. Thank you to everyone from the grassroots up for their continued support and commitment going forward. Thank you to our generous sponsors and contributors thus far and for their on-going support into the 2016/2017 season and beyond.